The Alliance Linking Leaders in Education and the Services (ALLIES) is an undergraduate organization dedicated to improving civilian-military relations. They were founded at Tufts University by students involved in the Institute for Global Leadership’s (IGL) EPIIC program in 2006. 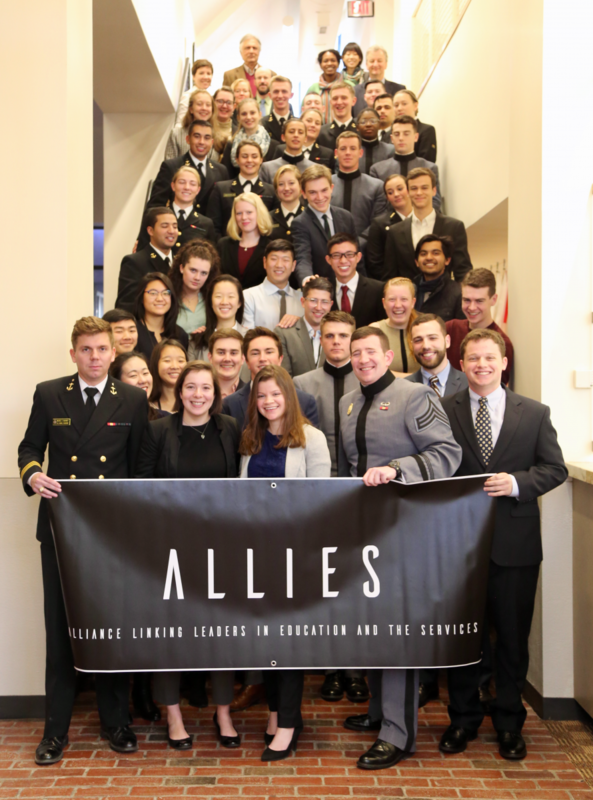 ALLIES has grown to encompass chapters at Tufts, the United States Naval Academy (USNA), and the United States Military Academy (USMA) at West Point, and Wellesley College. They are currently working on expansion and are developing relationships with the University of North Georgia, the Virginia Military Institute, the University of North Carolina at Greensboro, and the George Washington University. The Tufts ALLIES chapter meets weekly for discussions on a range of topics, sometimes expert-led, sometimes student-led. They also bring in a range of guest lecturers throughout the year, host an annual Civil-Military Relations Conference, organize a Field Exercise simulation, and participate in the annual Joint Research Project. The weekly discussions this year cover topics such as North Korea and nuclear weapons, the business of war, and the military in the media. ALLIES also invited experts to engage with students and further enrich their weekly discussions. This semester’s speakers included Lieutenant General Charles D. Luckey, the Chief of the Army Reserve and Commanding General of the United States Army Reserve Command, who spoke about the future of civil affairs officers, the dangers of soldiers’ overreliance on advanced technology, U.S. readiness to confront war, and the implications global climate change. Another guest lecturer was John Horgan, a political psychologist who studies conflict and uses a behavioral approach to understanding terrorism. Horgan spoke about his work examining the process of radicalization and explored methods of countering or preventing violent extremism. Alice Hunt, who is a senior fellow in the International Security Program at the Center for Strategic and International Studies (CSIS), discussed the U.S. military presence in Niger. She spoke about the conflict surrounding Niger since the October 2017 ambush, which left four U.S. soldiers dead, as well as the country’s history. In addition to the guest lectures, ALLIES facilitated a tactical planning simulation with Lieutenant Cutler Dawson, who is studying at The Fletcher School. One of the biggest events that ALLIES hosts is its annual Civil-Military Relations Conference (CMRC). CMRC is the group’s signature fall conference that brings together the Tufts community, students from several civilian and military institutions, and field experts. This year’s conference focused on the defense industry, global arms trade, and foreign relations. The keynote speaker was Douglas Farrah, who is a Senior Associate in the Americas Program at the Center for Strategic and International Studies as well as a Senior Fellow at the International Assessment and Strategy Center. He spoke extensively about the fragile state of the liberal world order and how it has perpetuated the global arms trade. Visiting delegations came from Wellesley College, the U.S. Naval Academy, the U.S. Military Academy, the University of North Georgia, the Virginia Military Institute, and The George Washington University. Click here to read more about the ALLIES Fourth Annual Civil-Military Affairs Conference. ALLIES is now planning for its Spring semester. FieldEx, which is focused on peacekeeping and stability operations, will run the simulation on the relationship between states and illicit non-state actors, helping participants to better understand the challenges of removing criminal groups from power. The Joint Research Project brings civilian and military students together to conduct research on different aspects of civil-military relations in another country. Countries under consideration for this year are Finland and Estonia.